Big Up Radio (bigupradio.com) is proud to present its very first Gospel Reggae radio show Island Vibes this Sunday. Island Vibes is hosted by DJ Deli of Caribbean Gospel Surf and will air on Bigupradio's Roots station every Sunday. The two hour weekly program will include the best in Gospel Reggae and listeners can also look forward to special features and interviews. Big Up Radio (bigupradio.com) is proud to present its very first Gospel Reggae radio show Island Vibes this Sunday. 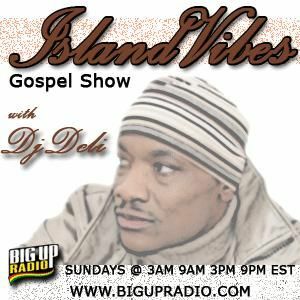 Island Vibes is hosted by DJ Deli of Caribbean Gospel Surf and will air on Bigupradio's Roots station every Sunday. The two hour weekly program will include the best in Gospel Reggae and listeners can also look forward to special features, exclusive interviews and more!